Meagan Marie to join Shelley Blond in the 20th Anniversary celebration of Tomb Raider music in London. 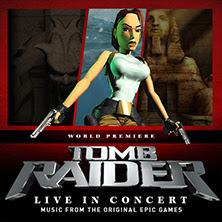 U-Live and Eden Films are proud to present TOMB RAIDER LIVE IN CONCERT at the Eventim Apollo, Hammersmith, in London on Sunday December 18th, 2016. Joining Shelley Blond – the compère and original voice of Lara Croft – will be Meagan Marie, author of 20 Years of Tomb Raider and Senior Community Manager at Crystal Dynamics in San Francisco. Her passion for Tomb Raider has endured throughout her life — spanning from dressing up as Lara in her youth to working on the franchise as an industry professional. Meagan will be presenting the Prize Draw where three audience members will receive a special 20th Anniversary prize. At the age of 12, Meagan wanted to be Lara Croft. After realizing that a “fictional character” wasn’t a vocation, she set her sights on working in the video game industry. She worked at Game Informer for several years when her cover story for the Tomb Raider reboot introduced her to the team that actually make the game: Crystal Dynamics in San Francisco. As Senior Community Manager, over the past five years, Meagan has been responsible for establishing and evolving the brand presence on social media, engaging with fans online and at events worldwide, and acting as a studio spokesperson. The job has allowed her to travel everywhere from Singapore to São Paulo, feeding a flame for adventure originally ignited by Lara. A long time cosplayer, she is also the creator of Causeplay Shop in Facebook which brings cosplayers and geek artists together for semi-annual sales that benefit charitable causes. Her passion for Tomb Raider has endured throughout her life—from dressing up as Lara in her teens, to saving allowance money for variant comic covers, to keeping a constant eye out for her next outdoor adventure. She still dresses up as Lara Croft. Some things don’t change. · This year is the 20th Anniversary of Tomb Raider. · To celebrate this, Nathan McCree has composed The Tomb Raider Suite, which will be performed live by an 80 piece orchestra and choir! · The concert will also include full-size backdrop projections of extracts from the TR I, II & III games.